Jose Mourinho, who until Saturday was the manager of Spanish La Liga giant, Real Madrid, has confirmed that he had a rift with some players in the team while also confirming that he will take over as coach of Chelsea this week. He left the Santiago Bernabeu on Saturday night without saying goodbye to star players Cristiano Ronaldo, Pepe and Iker Casillas, having suggested all three had deliberately ruled themselves out of his last game in charge. Mourinho had left as many as 10 first-team players out of his final squad for Saturday’s visit of Osasuna, but claimed that, while many were injured and had been ruled out by the club’s medical staff, Ronaldo, Casillas and Pepe had all taken it upon themselves to miss the last game. He told Spanish television channel Intereconomia: ‘The players not in the team had either been declared injured by club doctors, or have declared themselves injured. The disintegration of player-coach relations after Real Madrid’s Champions League semi-final exit against Borussia Dortmund intensified after the charade of the Spanish Cup final, which Real lost with both Mourinho and Ronaldo sent off. It had reached such levels that it seems the star players wanted no part in their coach’s send-off. And as if to underline the divisions, defender Alvaro Arbeloa, who was one of the players who had stayed loyal to Mourinho in what had become a dressing-room war against the coach, claimed the manager had been betrayed by his players. The Spain defender, who also played for Liverpool, suggested that Mourinho was let down by selfish players. ‘Mourinho gave everything for the club, always putting it first, and sometimes his image was affected by that. I am not sure everyone else, players included, can say the same. The split between Mourinho and his players was never as clear as in the tunnel before the final home game of the season as he waited until the last moment possible to take to the pitch. 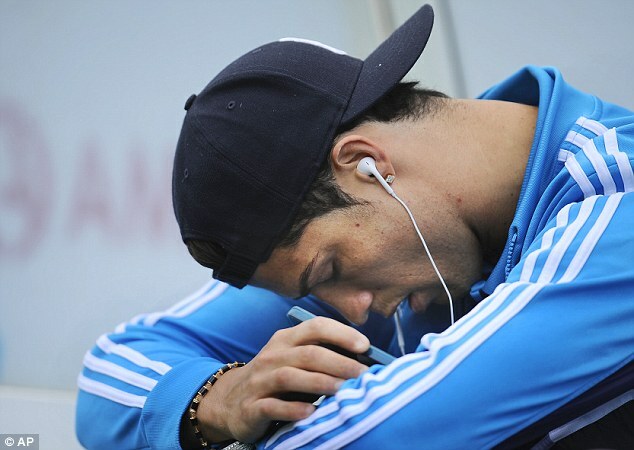 Ronaldo was also in the tunnel waiting to be awarded a post-season prize, and not a word was exchanged between the pair. Pepe and Casillas appeared at the top of the stairs that lead to the dressing room, ready to watch the game from the private players’ boxes high up in the Bernabeu. They looked down on Ronaldo. 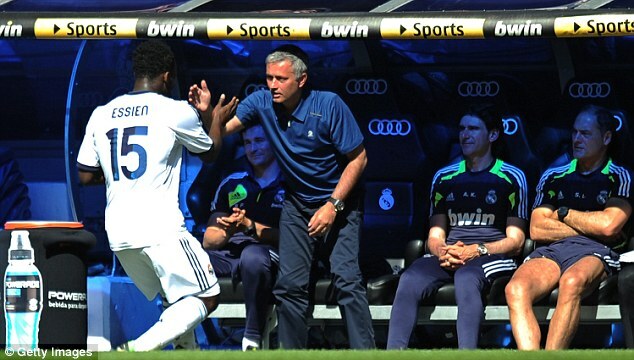 He looked at Mourinho, who looked out on to the pitch, avoiding eye contact with his three errant players. It was an image to sum up a tempestuous last season in charge when, for the first time in his career, the Special One had lost the dressing room. ‘We have to learn for next season,’ said Arbeloa. ‘With the new coach, we have to be united with everyone helping each other. 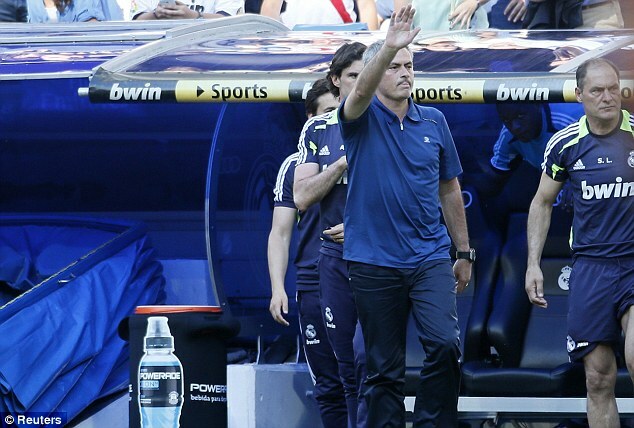 As if the divisions in the dressing room weren't enough, the fans in the stands of the Bernabeu were also divided about the self styled special one. Supporters behind one goal sung his name throughout the 4-2 win but the songs were drowned out by jeers from the remaining three sides of the stadium. There were ‘Thanks for everything’ signs held aloft but others read, ‘Thanks for nothing’ and ‘Don’t ever come back’. 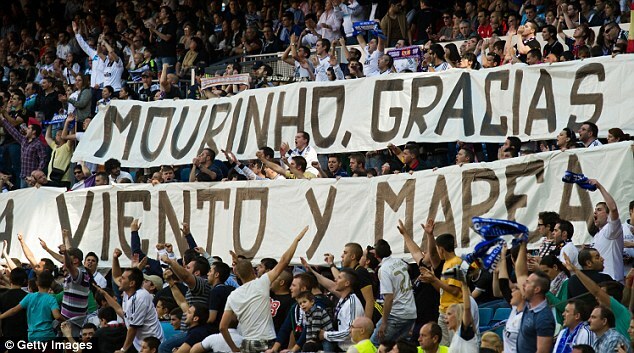 The most vocal of the pro-Mourinho supporters hung a ‘Mourinho we love you’ banner from the stand behind the south goal. The outgoing coach came back out to those supporters after the end of the game to have pictures taken with several who had made their way on to the pitch. 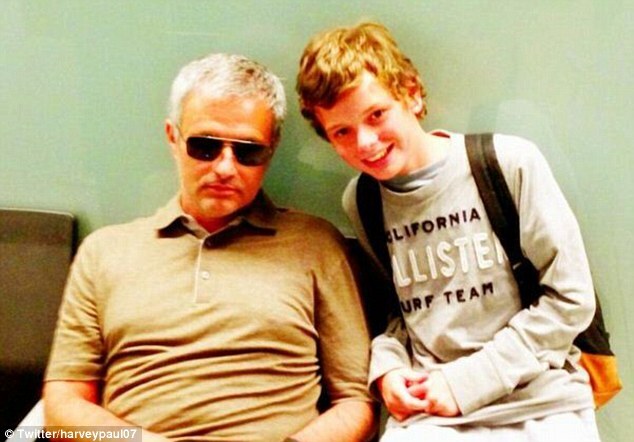 The game itself saw Mourinho clock up his 128th win in his 178th game in charge. It also meant the club had gone the entire season without losing at home — save the cup final when they had occupied the away dressing room. 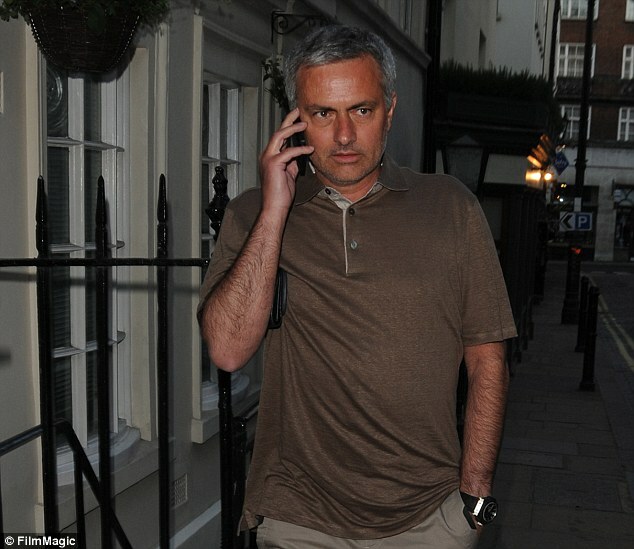 Meawhile, Mourinho confirmed that he will take charge of Chelsea later this week. 'I'm going to London on Monday and at the end of the week I will be the manager of Chelsea,' he said to leading Spanish TV football show Punto Pelota. 'I feel the people there love me and in life you have to look for that. 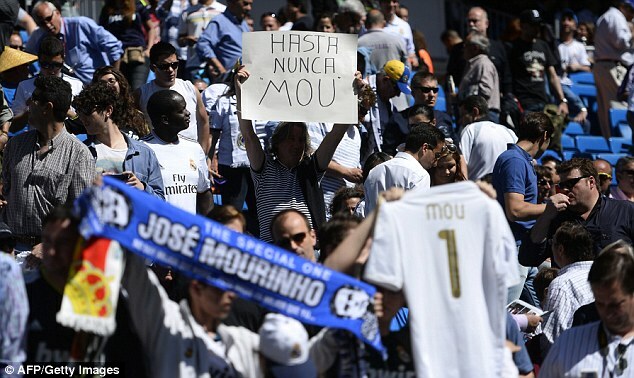 Never have the words ‘the bitter end’ been more apt as Jose Mourinho took charge of his last game at Real Madrid before returning to Chelsea. 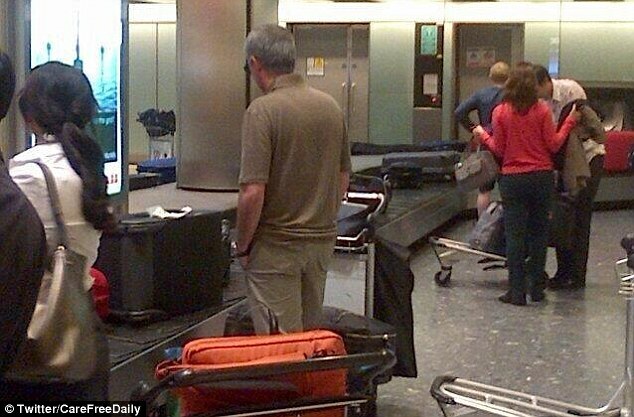 He was spotted with his son at the Heathrow Airport in London on Sunday as he closed in on his return to Chelsea.